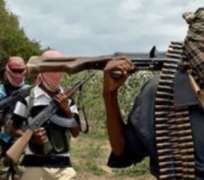 Suspected members of the Boko Haram Islamist sect ambushed three first class traditional rulers between the Biu -Azare-Garkida Road in Borno State. The royal fathers are the Emir of Gwoza, Idrisa Timta who was killed, and his counterparts from Askira Abdullahi Askirama, and the Emir of Uba, Ismaila Manza sustained varying degrees of injury. A statement by the Director of Defence Information, Maj.-Gen Chris Olukolade, he said the body of Gwoza Emir who was killed by the attackers has been recovered, while the Emirs of Askira and Uba are in stable conditions. 'A band of terrorists today attacked the emirs of Gwoza, Uba & Askira who were travelling to Gombe for the funeral of the late Emir of Gombe. 'Troops deployed in Garkida responded to the attack. The emirs of Uba and Askira were secured, while the body of Emir Gwoza who died in the attack has been recovered. ' he said.